Learn about the state and federal laws that protect burial sites, Native American mounds, and other places where human remains are buried. Moving human burials should only be undertaken as a last resort. Read these articles to learn the procedures to follow. 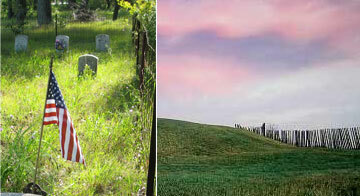 Though State law protects all human burial sites, older burial sites and mounds are sometimes damaged. Learn what you can do to help protect them. This catalog lists human burial sites with known locations and a certainty or likelihood that human remains are present. What is the Difference Between a Cataloged and Uncataloged Burial Site? Have you been digging and found a bone? By State law, all discoveries of suspected human bone must be reported immediately. Stop, call your local police, do not move or handle the remains, and read our instructions below. Learn how this landowner handled the discovery of human remains on her property. Are you a member of the archaeological community? Find information, guides and forms to assist you with preservation laws and resources. If you have a human burial site on your property, you may be eligible for a tax exemption. See more about landowners rights and responsibilities below. Contact Kim Cook by phone at 608-264-6493 or by email below for questions about human burials, mounds and cemeteries.